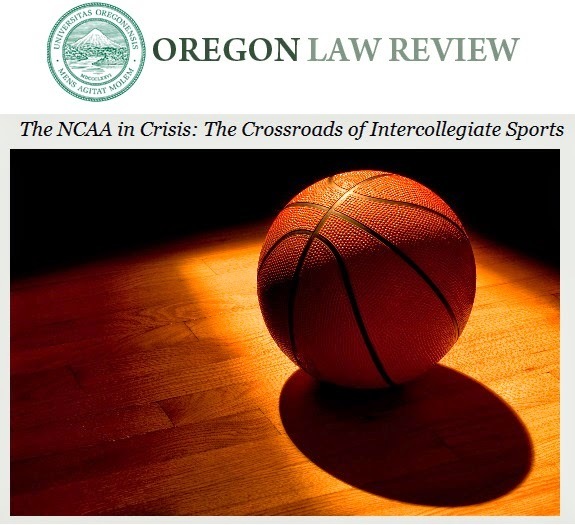 I'm honored to be participating in the upcoming Oregon Law Review symposium titled NCAA in Crisis: The Crossroads of Intercollegiate Sports. The topic couldn't be more timely. The symposium will be held on Friday April 11. Warren Zola and I will be giving the introduction to the symposium (to be delivered by Warren). Excellent work by Dustin Littrell, the Editor-in-Chief of the Oregon Law Review, and Kristina Cauthorn, OLR's Symposium Editor, in organizing the event, developing the panels and assembling an outstanding group of speakers. Oregon Law Review's spring symposium, The NCAA in Crisis: the Crossroads of Intercollegiate Sports, will provide a forum for a comprehensive inquiry into questions regarding the current state of NCAA regulations and enforcement, and an analysis of Ed O'Bannon v. NCAA and its potential implications on amateurism, anti-trust law, the gaming industry, and possible legislature involvement. Through this inquiry, Oregon Law Review hopes to formulate and analyze possible solutions to the NCAA's current issue: how does the NCAA amend its regulatory and enforcement mechanisms to create a more efficient, effective, and fair organization? This should be an outstanding event! For more info, click here. I recently co-authored (with Tassos Kaburakis and John Holden) and served as counsel of record in connection with a cert stage amicus brief filed in the New Jersey/PASPA case. This case is now at the U.S. Supreme Court ("SCOTUS") level. The SCOTUS docket can be found here. A link to the amicus brief is here. I penned a short piece summarizing New Jersey's cert petition here. Unlike the more common 9,000 word merits stage amicus briefs (filed after SCOTUS has granted cert), cert stage amicus briefs are limited to 6,000 words. As such, a number of findings were left on the cutting room floor. One of the most interesting was legislative history indicating that the senators debating the bill (S. 473) were unsure about which states would be exempted under PASPA's unique grandfathering clause. For example, one senator posited that he thought South Dakota would/should be exempted. PASPA passed by a 88-5 vote. Wisconsin senator Herb Kohl, the owner of the NBA's Milwaukee Bucks, did not vote "yes" or "no" on PASPA, opting for "present" instead. Six senators did not vote at all. The cert petition (and two other amicus briefs) focus on PASPA's interaction with anti-commandeering and equal sovereignty arguments stemming from the Constitution's Tenth Amendment. We primarily focus on PASPA's text vis-a-vis the Intellectual Property Clause (Article I, Section 8, Clause 8) of the Constitution. We spend time examining Sec. 3703 of PASPA. April 21, 2014 is the deadline for the NCAA/NBA/NFL/NHL/MLB (original plaintiffs) and DOJ (intervenor) to file a response to the cert petition. At some yet-to-determined date, the justices will decide whether to grant the cert petition. Stay tuned. Mike's post yesterday about the Peoria Star's publication of a picture of a high school athlete holding his two middle fingers up concerns a topic of my 2009 law review article in which I discuss at length how journalism ethics codes can and should be incorporated into tort law standards for defamation, false light, and public disclosure of private facts claims. In essence, the tort of false light affords a remedy when the press oversteps its bounds by the careless or highly offensive manner in which facts are presented. False light's resemblance to defamation has caused confusion in the courts as to the proper balance of the First Amendment. The source for much of this confusion emanates from Time, Inc. v. Hill in which the Supreme Court held that the actual malice standard applies to false light claims involving false publication of matters of public interest. The actual malice standard requires a showing that the defendant published a factually inaccurate report with knowledge of its falsity or in reckless disregard of the truth. Indeed, the actual malice standard has preempted many false light claims in the courts. However, the actual malice standard is capable of application only when the false light claim involves a publication that contains factual inaccuracies. But false light is not limited to publications that contain factual inaccuracies; it also encompasses a publication that is literally or substantially true but which creates an erroneous or misleading impression that renders the publication susceptible to inferences casting the plaintiff in a "highly offensive" false light or making the plaintiff out to be something he or she is not. In this latter context, the actual malice standard simply does not work because the standard is premised on the publication of false information (and there is none). From a First Amendment standpoint, courts should be cognizant of the material distinction between a critique, which is not actionable, and a misleading or an erroneous inference that makes the plaintiff out to be something he or she is not and thereby casts the plaintiff in a highly offensive false light. The former is constitutionally privileged because it has social value and entails the legitimate motive or purpose of engaging in “uninhibited and robust debate.” However, the First Amendment interest is weaker when the press acts with a motive or purpose of making the plaintiff out to seem pathetic or ridiculous, regardless of whether the plaintiff is a public person or private person. Perhaps the First Amendment interest is weaker in this context because journalism ethics are being compromised—the two have a tendency to go hand in hand. Indeed, the motive of the press is certainly relevant from a journalism ethics standpoint. Courts are sometimes hesitant to consider a publisher’s motive in finding actual malice, which is understandable when the focus of the inquiry pertains to the publisher’s knowledge of the falsity of the information. But motive can and should be a relevant factor for the courts in assessing the degree of offensiveness in which the plaintiff is placed in a false light. Chicago is abuzz over a high school basketball state semifinal but it has nothing to do with the incredible performance on the court phenom by Jalen Brunson. Brunson was suspended by the Illinois High School Association (IHSA) after a photographer captured a still image of Brunson holding his two middle fingers up during a game and then publicized the image. Brunson -- a junior point guard at Adali E. Stevenson High School in Lincolnshire, Illinois, and the son of former NBA point guard Rick Brunson -- is one of the most recruited basketball players in the country. In last Friday night's Class 4A boys state semifinal game, Brunson scored a state-tournament record 56 of his team's 68 points in a 75-68 loss. During that game, Brunson threw his hands up after one of his three pointers was waved off by an official. While doing so, he momentarily extended his middle fingers on both hands. Then consider that no one at the game noticed. Not the refs, not the fans, not either team's coaches or their players. Not Brunson's parents, who were there, or parents of other players. Literally no one. And no one after the game said anything, either. But someone noticed: photographer Ron Johnson of the Peoria Star. 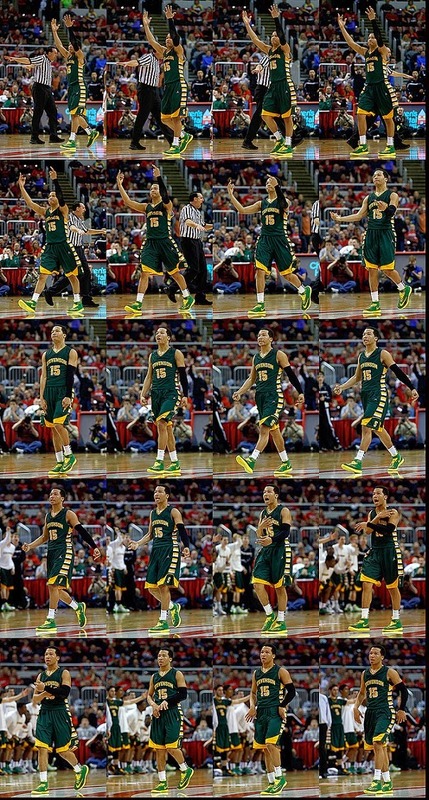 He published the image on-line with the caption "Jalen Brunson of Lincolnshire Stevenson makes a gesture to the Chicago Whitney Young crowd." It sparked an uproar and the IHSA decided to suspend Brunson for the following game. Brunson apologized on Twitter, but stressed that he did not intentionally give the middle finger. It occurred unintentionally while he had thrown up his hands in frustration. Brunson and his family appeared at a hastily called hearing with the IHSA set just hours before the consolation game. They argued that the photo -- a mere still image representing a fraction of a second in a bodily movement -- was taken completely out-of-context and that the IHSA was punishing Brunson because of public reaction, not because of wrongdoing. They also argued that no one at the game noticed. The IHSA agreed and the suspension was reversed. There is now much debate about the journalistic ethics of Johnson capturing one still image and running with it. In Johnson's defense, the image is real and was not doctored. It captures Brunson's body at a split second in time when Brunson unquestionably extended both middle fingers and made what in the United States and much of the world is an obscene gesture. There is no possible defamation claim because truth is an absolute defense, and the First Amendment protects Johnson as well. But that doesn't mean it is fair or ethical to attribute a narrative to a split second shot. It stands to reason that if someone photographed us all the time, especially while playing sports, we might unknowingly make gestures that are offensive. There is also a potential legal angle through the tort of false light, especially if Brunson believes the image will cause him long-term reputational harm. Generally speaking, false light is when a defendant intentionally or recklessly makes a statement (be it in text or visual) that is technically not false but is badly misleading—it places the plaintiff in a false light—and would be highly offensive and embarrassing to a reasonable person. While truth is an absolute defense to defamation, it is not an absolute defense to false light. False light is a recognized tort in Illinois. It will be interesting to see whether the photo leads to any legal action. The case highlights how star athletes—kids really—are placed under a microscope and how with today's technology literally their every movement can trigger controversy. Certainly must be an interesting time to have a leadership role in college athletics. Texas Tech's Brian Shannon, the Thornton Professor at the School of Law, has been reelected President of the D-IA Faculty Athletics Representatives Association. The FAR is a required position under NCAA rules held by a faculty member at Association schools. Georgia's David Shipley has this paper on the role of a law professor filling the FAR job. Professors Shannon and Shipley are among a number of law profs who currently serve or have previously served as NCAA FARs. Among others on that list are my former colleague Jim Klein (Charleston), Patricia Bellia (Notre Dame), Jim O'Fallon (Oregon), Clare Pastore (USC), Eleanor Myers (Temple), Gary Neustadter (Santa Clara), Milt Shroeder (ASU), Ronald Rychlak (Mississippi), and I'm sure several others. 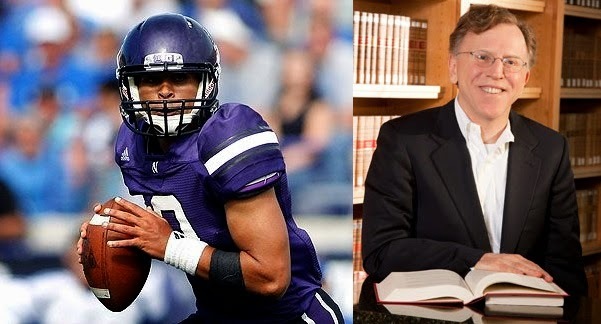 It was a historic day in sports law: a regional director of the NLRB ruled that Cain Kolter and other Northwestern football players can form a union. There are many steps ahead. I have a Q/A on SI.com with Zac Ellis and I was a guest on PBS Newshour tonight. The following op-ed is written by Professor Steven Willborn, the Judge Harry A. Spencer Professor of Law at the University of Nebraska College of Law (where he served as the Dean between 2001 and 2009). Kain Colter, a quarterback, is trying to unionize the Northwestern football team, and the NCAA is worried. To unionize under the National Labor Relations Act (NLRA), Colter needs to prove he is an “employee.” The NCAA fears that labeling college athletes as employees will upend the entire structure of college athletics. It is most worried about one part of that structure – the financial structure which produces billions in revenues with a primary workforce that earns, well, not much. It turns out that Colter is an employee, but the NCAA should not be so worried. Instead, it should plan for the day when college athletes are considered employees. Whether Colter is an employee under the NLRA is a close call. The closest cases involve teaching assistants at universities. The National Labor Relations Board has held that they are “primarily students” and, thus, not employees under the NLRA. But some of the reasons the Board gives for teaching assistants do not apply to college athletes, such as the close tie between teaching and academic program and the close personal relationships with professors. But maybe the Board will think Colter is more like a singer in the chorus at the Seattle Opera than a teaching assistant. These singers signed “letters of intent” to sing with the opera, worked under close supervision, and received minimal compensation. The Board found them to be employees. Maybe that’s the better analogy. In either event, it’s a close call for Colter. But even if Colter is not an employee under the NLRA, it does not mean he is not an employee under every statute everywhere. He may have a stronger claim that he is an employee under the Fair Labor Standards Act, which requires minimum wages and overtime premiums. If injured, he might seek damages as an employee under the workers’ compensation laws. If sexually or racially harassed, he might seek recourse under employment discrimination statutes. (Things like that have been known to happen in football.) Colter himself might be an employee under dozens of different statutes. Nationally, college athletes could make claims under hundreds of different employment statutes, each with their own definition of “employee.” This is why Colter is an employee. Even if he is not one under the NLRA, he is one somewhere, for some purpose. Looking beyond Colter, college athletes have so many opportunities to make the claim under so many statutes that, someday, somewhere, they are sure to be classified as employees. The NCAA should be worried about this. Many of its regulations simply do not align well with some employment statutes. But the NCAA shouldn’t be completely distraught. Unionization, for example, would not necessarily conflict at all with any NCAA regulations. It would only require Northwestern to sit down with the football players and talk. No violation there; the NCAA says it already does that. The NLRA doesn’t require the NCAA or Northwestern to agree to any changes the players might demand that would conflict with current practices. None. Similarly, I do not know of any NCAA regulations that say that college athletes cannot seek full recourse if they are sexually or racially harassed. Some employment regulation would conflict with current NCAA policies. The NCAA’s current practices, for example, would run into trouble under the Fair Labor Standards Act which requires modest payments for work, mostly in cash. But maybe requiring “fair” labor standards wouldn’t be a bad thing? Maybe it would even be a good thing? So, yes, the NCAA should worry. But mostly it should plan for the inevitable day when college athletes are determined to be employees. The NCAA will have a more challenging task when that day arrives. Complying with employment laws is complicated and expensive. But that’s true for all employers. For better or worse, we as a society have decided that those complications are worth it to ensure fair wages, nondiscrimination, and the other things protected by employment statutes. If it tries hard, the NCAA will be able to accommodate to this new world. We know that sports leagues can be managed even when the players are employees. There are a few fairly well-known sports leagues that manage to operate under that condition, such as the National Football League and the National Basketball Association. (Although their profit margins tend to be much lower than those of big-time college football teams.) It can be done. So Kain Colter may win his NLRA case and be an employee. Or he may lose and we will have to wait for the day when he or another college athlete is determined to be an employee under some other employment statute. But that day will come. And the NCAA should begin planning for that day now. Our own Alan Milstein has some terrific insight on the new NCAA lawsuit in this article by Erin McClaim for NBC News, including raising the issue of whether high school players may hire agents if they can negotiate compensation with colleges. Milstein said he believes this case goes several steps beyond the other NCAA lawsuits — and probably a step too far. He stressed that he is a strong critic of the NCAA, which he described as a “walking, talking antitrust violation,” and supports a system under which college athletes would be paid an hourly wage, just as students working the concession stand are. They could even be allowed to negotiate their own shoe endorsements, he said, but the suit filed this week would lead to universities’ gambling huge sums of money on high school stars with agents, he said. In a move that will make it harder for the NCAA to transfer the ever-expanding In Re NCAA litigation out of California to another court, such as one in Indiana, Judge Claudia Wilken has just deemed former West Virginia running back Shawne Alston's lawsuit v. NCAA to be a related case. Alston sued the NCAA earlier this month in the the U.S. District Court for the Northern District of California -- the same court hearing O'Bannon and Keller -- arguing restrictions on athletic scholarships violates antitrust law. He hopes the suit will become a class action. Today was also eventful because four current players, led by sports attorney Jeffrey Kessler, sued the NCAA over athletic scholarships in a lawsuit similar to one brought by Alston (Kessler's case is unaffected by Judge Wilken's order). 1. McCann: Am I right that this means that the Alston case is now, like Keller and O'Bannon, part of In: Re NCAA? Jon King: Yes, although all 3 cases will proceed on different schedules – just as Keller and O’Bannon currently are on different schedules. The main import of today’s ruling is that it will make it much tougher for the NCAA or the Conference Defendants to successfully argue that the Alston case should be transferred to another district court, such as in Indiana, where the NCAA is headquartered. 2. McCann: Will you and other lawyers for Alston be part of the decision-making process for the plaintiffs in O'Bannon and Keller? Jon King: No -- everything is separate in terms of the decision-making – but it happens to be that my firm is lead counsel in Keller, and one of the two firms that filed Alston – the effect of a “related case order” like today’s is really more about the Judge –means that the Judge will have oversight over all of the cases and make sure they are all coordinated and efficient – that is a lot easier to do if one judge is presiding over all of the cases – for example, it can help so that the same witness does not need to be deposed multiple times by multiple groups of plaintiffs – can get everything coordinated in one spot and on one day. Some of this is easier said than done, but definitely easier to do if only one judge involved. 3. McCann: I assume this also means that, given the similarities of Kessler's case to the Alston case, Kessler's case may eventually be deemed a related case as well, even if filed in a different state? Jon King: It is a more complicated question as to his case – because it was filed in another federal court, in New Jersey, as opposed to here in the Bay Area – there are a few other ways in which cases in these circumstances can be combined – one of the ways is by going before the Judicial Panel on Multidistrict Litigation, a panel of 7 federal judges that decides where to centralize cases where there are similar ones in different districts around the country. The NCAA also has a deadline by which players must declare their intention to return to college. The kicker? The NCAA requires that college athletes announce by April 15th. A full 62 days before the NBA requires they do so. Thus, the incongruity of these deadlines, the NCAA requires a decision before ANY of the NBA dates kick in. It is no coincidence that the NCAA deadline of April 15th is early, it's so that college coaches are able to know who is returning to their rosters before the April 16th men's basketball signing period. This imposed deadline was created with the direct purpose of assisting in recruiting and has nothing to do with what's best for the college athletes. The NCAA program which allowed prospects the ability to work out and get an unbiased and informed perspective on their pro potential is moot. Why? Because NBA teams won't work out players until their deadline (April 27th) has passed and someone has declared for the draft. And despite NBA Commissioner Adam Silver's intent on having the NBA, NBPA, and NCAA all in a room agreeing upon dates, age eligibility requirements, and other issues (as reported here at Boston College's Chief Executives' Club of Boston event) there is the legal barrier to this conversation ever taking place: collusion. The NCAA is not a legally recognized bargaining entity. Darren Heitner wrote this piece. Marc Isenberg penned this article. Andy Katz here and here, Eamonn Brennan here. There was, of course, the great and path-breaking law review article written in 2004 by our own Michael McCann titled "Illegal Defense: The Irrational Economics of Banning High School Players from the NBA Draft." McCann was the first person to show through empirical analysis of both on and off the court performance that players skipping college were the best players in the NBA and that an age restriction is irrational. McCann followed up Illegal Defense in 2005 with an empirical study on NBA players who have been arrested and their education level. Again, nothing new in this post, just a reminder of the asinine nature of the NCAA restricting college students from making an informed choice about their future careers. I previously wrote that the ends do not justify the means in MLB's PED investigation, and that payments to witnesses for testimony are unethical. Now, the New York State Bar Association has come out with Ethics Opinion 997 that reiterates that lawyers may not pay for witness testimony beyond reasonable time and expenses incurred by that witness (for some strange reason, purchasing physical evidence is now O.K. in New York). So if it is true that MLB's lawyers participated in paying witnesses in the A-Rod case millions of dollars, and if the arbitrator allowed such testimony, what will happen to these lawyers and arbitrator? We'll have to wait to see, but no matter how big or powerful, good trial lawyers know that if you have to pay for testimony, you don't have a case, and these ethics rules don't change, just because you want to bag a big bad fish. Moreover, just like I predicted, this lawsuit was dropped by MLB once A-Rod capitulated, which proves that it was frivolous to begin with and designed solely to procure "evidence" that MLB otherwise could not have gained. I'm sure that people feel as sorry for A-Rod as they do for Lance, but however good it feels to see these guys brought to justice so-to-speak, Justice is not done, when lawyers and arbitrators engage in illegal use of paid witness testimony, and everyone involved should be, at the very least, embarrassed, if not ashamed. Kostya Kennedy has a new book on Pete Rose, titled Pete Rose: An American Dilemma, excerpted in this week's Sports Illustrated cover story. Kennedy states that Rose's Hall-of-Fame worthiness has come under "renewed discussion" as players linked to PED use (Mark McGwire, Barry Bonds, Roger Clemens) come up for Hall consideration. The excerpt (and presumably the book) present the arguments that Rose' gambling is a lesser crime than PED use, so he should be a more worthy candidate for the Hall than a juicer. Will Leitch at Sports on Earth responds and basically blows up the argument, by pointing out the serious problems that gambling creates and the moral panic and uncertainty that surrounds PEDs. But there is a different, more legalistic reason Kennedy's article gets Rose's Hall eligibility wrong, one I discussed eight years ago, just as the major PED suspects were beginning to retire. Rose is ineligible for the Hall because he voluntarily accepted a lifetime ban from baseball and placement on baseball's permanently ineligible list. Under Rule 3E of the BBWAA voting rules, "Any player on Baseball's ineligible list shall not be an eligible candidate." And that ends the inquiry. It actually does not matter whether Rose bet on baseball or on the Reds (he admitted gambling on baseball, although never on games involving his team)--he accepted the ban and thus the collateral consequence of the ban. On the other hand, no suspected steroid user has ever been assessed a lifetime ban or placed on the permanently ineligible list, thus none is subject to Rule 3E. Steroid users are being kept out of the Hall by the principled insistence (or priggish obstinance, depending on your perspective) of BBWAA members. Of course, we might reconsider this ordering, which would require reconsideration of the comparative evil of steroid use and gambling. Under present rules, a person is banned for life for a third positive test or finding of PED use, but banned for life on one finding of having bet on games involving his team. Perhaps that should be flipped, or at least treated on equal footing. (On this, I agree with Leitch that we have the order right, that gambling is a far greater sin than taking drugs designed to help you play better and for longer). But none of that changes anything for Rose given the current rules and the rules under which he operated. Just by coincidence, Deadspin has three stories that touch on the importance of procedure in and around sport. 1) Jonathan Mahler promotes the argument that the way to get the NCAA is for a single college athlete or high school senior to seek a declaratory judgment that NCAA rules regarding student-athlete compensation violate the antitrust law and an injunction against continued enforcement of those rules. Mahler argues that this lawsuit and this more-limited remedy avoids the extensive delays, distractions, and discovery that come with class actions and with claims for damages. The Unfortunately, the article ignores a few other procedural issues that could present problems, including standing and mootness (the NCAA might run out the clock until the player uses up his eligibility, mooting his request for injunctive relief). 2) Tampa Bay Rays manager Joe Maddon is drilling his players on continuing plays after the apparent third out of an inning, in case the third out is overturned on video review. The idea is that this can affect where the runners are placed after review. If the Rays defense get a "fourth out", that becomes the third out and the inning still ends. And if the Rays offense keeps running, the runners may get the extra base when the umpires replace them after video review. There are holes in the replay system that MLB has not yet even anticipated. 3) This story discusses the controversy over the women's indoor 3000 meters championship two weeks ago, which revolved around appeals procedures their manipulation, the too-cozy relationship between Nike and USATF, and the limits of video evidence as showing anything "conclusive" or "objective." The Indiana Tech Law School is pleased to present a timely concussion awareness event focusing on preventing brain injury in student athletes. 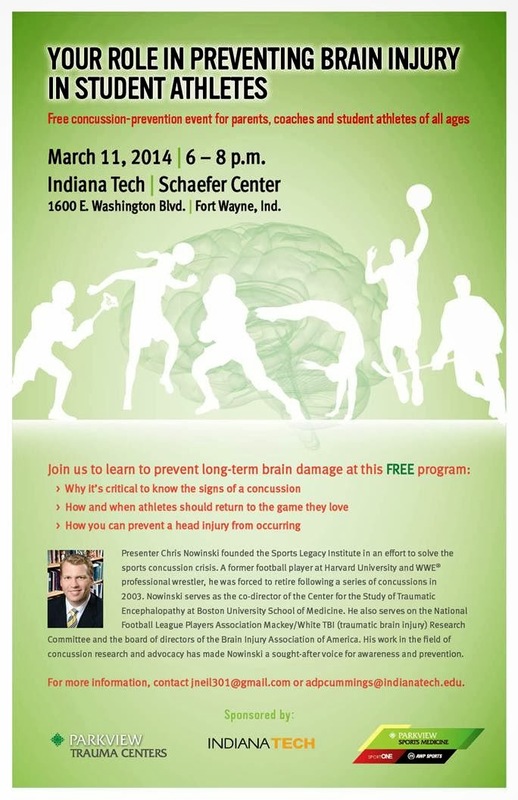 This event entitled "Your Role in Preventing Brain Injury in Student Athletes" will occur on March 11th, at 6 p.m. in Fort Wayne, IN, at the Schaefer Gymnasium on the Indiana Tech campus. Chris Nowinski, the co-director of the Center for the Study of Traumatic Encephalopathy at Boston University School of Medicine, will provide the keynote address. The event is free and open to the public. 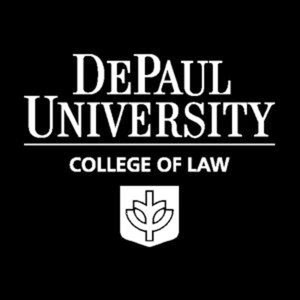 On Friday March 7th, starting at noon, DePaul University College of Law will host the latest iteration of its Sports Law Symposium. This year's topic is "The Economic Playing Field — A Symposium On The Legal Issues Facing Today’s Athletes". I am honored to be returning to speak at this event along with fellow SLB contributor, Marc Edelman. We, along with attorney Martin Greenburg will discuss "The Business of College Athletics" to kick-off the day. We will be followed by Lisa Levine (US Soccer), Evan Whitfield (Schiller, DuCanto), and Cari Grieb (John Marshall) who will discuss "Issues Arising in the Representation of Professional Athletes". For further information and registration, please follow the link here. 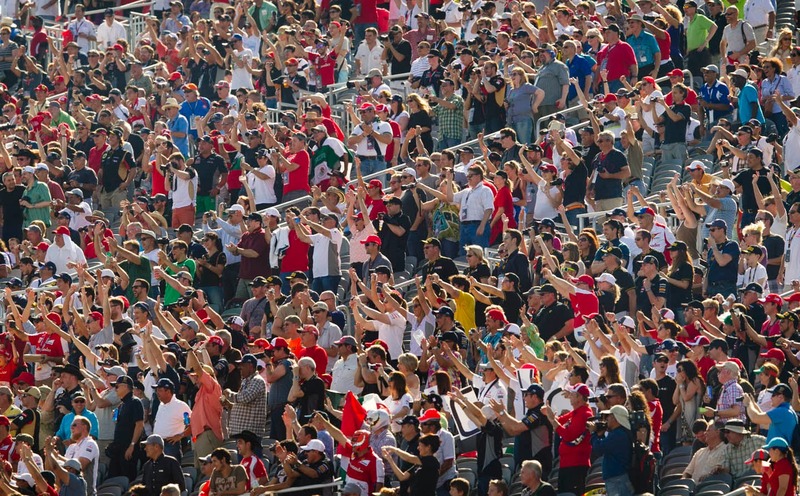 "This paper proposes the development of Fan Action Committees (“FACs”), which, like their political counterpart (PACs), could mobilize and empower fans to play a larger role in the decision-making associated with which “production teams” the talent will work. We outline two institutional options: FACs could directly compensate talent by crowdfunding, or they could make donations to charities favored by talent. We then discuss both obstacles and objections from a variety of policy and legal perspectives ranging from competitive balance to distributive justice. Finally, we consider possible extensions of the FAC model as well as offer some ruminations on why FACs haven’t already developed. Importantly, FACs create the potential for more efficient valuations of talent by registering not only the number of fans but also the intensity of their preferences. This insight, which stresses the upside of price discrimination, has relevance for a wide range of human endeavor where bilateral contracts have third party externalities that are not currently calibrated or adequately valued." "At some point in the not too distant future, the structure of college athletics as we know it will change. There are a multitude of possibilities of what this future world may look like -- and it may be far stranger than either George Orwell or Aldous Huxley could predict. Open markets and competitive bidding wars for high school players, salary caps for conferences, revenue sharing, agent representation and sponsorship deals for college athletes, and maybe even a student athlete union all within the realm of possibility." Introducing FanPay, the brainchild of Tony Klausing. Tony writes: "The idea is that fans would contribute to a pot of money to pay student athletes. This money is escrowed, then when the student graduates, he has the right to claim the funds--or else are refunded to the contributor in full." To see a beta of this website, check it out here. If you'd like to contact Tony directly with thoughts or comments, you can email him at: tony@prizl.org.